The end of World War II called for a big party. Soldiers and sailors were coming home; families were being reunited and it seemed that the worries of the 1930s and early 40s were over. All of the home front effort in war production had helped pull the country out of the depression. There were more jobs with better pay. Rationing was over and Americans wanted to spend money. For the first time, in a long time, any American housewife could buy something that wasn’t necessary or needed to run a household. The kitchen was usually the last place considered for “interior decoration”, but in the 1940s that began to change. Red and white, along with jadeite green and cream were always popular color schemes for kitchens. But now bolder colors like burnt orange and blue began to appear in paint and flooring. Kitchen curtains and utilitarian objects like storage canisters sported flowers or fruit. Matching chalkware wall decorations, instead of the usual grocery or hardware store calendar, were inexpensive, readily available, and brightened up the kitchen. Chalkware has been around since the 18th century. Contrary to its name, it is not made of chalk. Plaster of Paris is poured into molds and then painted in oils or watercolors. Chalkware figures were very popular as carnival prizes during the 1920s and 1930s, and in the 1940s chalkware ornaments were being made especially for decorating kitchens. One of the most popular motifs was fruit. In a lot of the United States, fruit was only eaten in season. Bananas, in particular, were considered by many to be exotic. 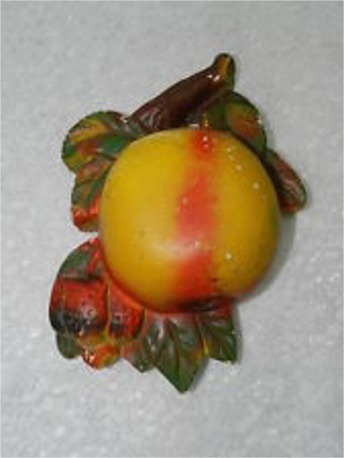 Collecting and artfully arranging brightly colored fruit on the kitchen wall lent an air of sophistication, although somewhat misplaced, that continued well into the 1960s. 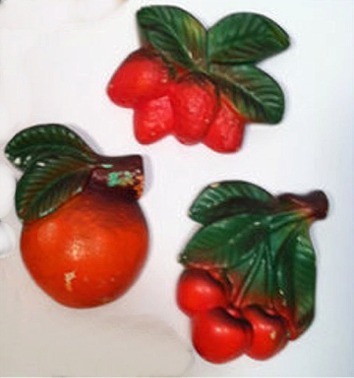 The chalkware pieces came in all types and sizes of fruit, from as small as two to three inches, to large multi-fruit plaques. The pieces sold anywhere from 15¢ to $1.50. Some pieces were simply for display, while others had specific uses like holding string, aprons or potholders. 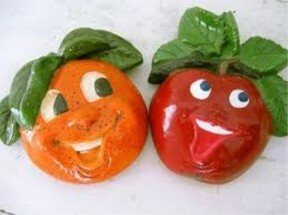 Some pieces were realistic looking, while still others were anthropomorphic (nonhuman fruit having human characteristics). Miller Studios designed a lot of kitchen chalkware during that time. The company paid a lot of attention to detail and that makes their pieces very collectible. Chalkware is fragile and the paint has a tendency to chip off, so many pieces have been discarded over the years. You can still find them a rummage or estate sales, as well as online like eBay. Chalkware is also very porous, so it should never ever be put in water. Clean it with a soft, dry cloth or a cloth that is barely damp. Wipe gently and use a cotton swab to work on recessed areas. Repainting bare plaster usually isn’t recommended because the paint can spread. You are better off buying pieces that are in good condition. Expect to pay anywhere from $2 to $100 a piece, depending on size and condition. I have several pieces of chalkware fruit in my collection. One of my favorites is a large string holder in the shape of a peach. I also have some small pieces of fruit that I like. I am not so fond of the anthropomorphic pieces, but sometimes they are actually the most collectible. Currently, my chalkware is living in a storage box while we continue with our DIY kitchen remodel. I haven’t decided if I will hang them up again, but you never know. And speaking of fruit, here is a piece of trivia about bananas. Did you know that Miss Chiquita Banana made her debut in 1944? She was created to put a face on one of the world’s first banana brands, according to the Chiquita Company. She was drawn by artist Dik Browne, who also drew the Campbell Soup Kids. The Chiquita jingle was written to help teach Americans how to ripen and use bananas, considered at the time to be an exotic tropical fruit. In 1944, the jingle was played 376 times a day the radio. It is considered one of the most successful commercial jingles of all time. In the 60’s and into the 70’s, my mother ran the Kern County Parks and Recreation Department’s handcraft program, providing 10 crafts for 1500 children each summer. I remember days of Bakersfield heat, pouring plaster into clear plastic molds, including the laughing fruit you show in this article. As the plaster started to set, we would add a telephone-wire hook in the back. After three days of curing, the placques were packed for transport to parks and recreation centers across the county, where children used watercolors to paint them, and then they were lacquered (liquid brushed on in the 60’s, moving to spray lacquer in the 70’s). This article brought back the memories.